Download "A Few of Our Favorite Things.pdf"
In a pan of COLD WATER, breast side down, in an unopened wrapper (please keep the clip out of the water) thaw your bird in the refrigerator. You may change the water in a pan every 3-4 hours, and turn the turkey half the way through thawing. Remember, thaw times are approximate and vary by individual refrigerator models and temperature settings. Naturally raised turkeys are non-injected and be basted and watched carefully while cooking. Approximate roasting times are printed on the outside of the turkey bag;however it is our experience that our turkeys cook much faster than the times listed on the bag. The USDA recommends roughly 15 minutes per pound at 325 degrees. 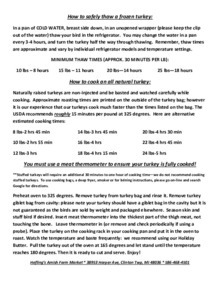 You must use a meat thermometer to ensure your turkey is fully cooked! **Stuffed turkeys will require an additional 30 minutes to one hour of cooking time—we do not recommend cooking stuffed turkeys. To use cooking bags, a deep fryer, smoker or for brining instructions, please go on-line and search Google for directions. Preheat oven to 325 degrees. Remove turkey from turkey bag and rinse it. Remove turkey giblet bag from cavity: please note your turkey should have a giblet bag in the cavity but it is not guaranteed as the birds are sold by weight and packaged elsewhere. Season skin and stuff bird if desired. Insert meat thermometer into the thickest part of the thigh meat, not touching the bone. Leave thermometer in (or remove and check periodically if using a probe). Place the turkey on the cooking rack in your cooking pan and put it in the oven to roast. Watch the temperature and baste frequently: we recommend using our Holiday Butter. Pull the turkey out of the oven at 165 degrees and let stand until the temperature reaches 180 degrees. Then it is ready to cut and serve. Enjoy! 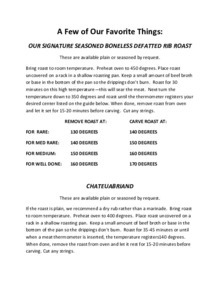 Download "How to safely thaw a frozen turkey.pdf"